For the last 70 years, antibiotics have been used to treat patients with infectious diseases, as a result, associated illnesses and deaths have been reduced considerably. However, antibiotics have been widely used for so long, that the infectious organisms that antibiotics are designed to kill have evolved and adapted to antibiotics, making the drugs less effective. In some cases, the microorganisms have become so resistant that there are no effective antibiotics available. Bacteria are living organisms that evolve over time. Their primary function is to reproduce, thrive, and spread quickly and efficiently. Therefore, they adapt to their environments and change in ways that ensure their survival. Selective pressures, natural selection and also societal behaviors are responsible for antibiotic resistance. Selective pressures (environmental factors which impact reproduction of a population) drive natural selection. 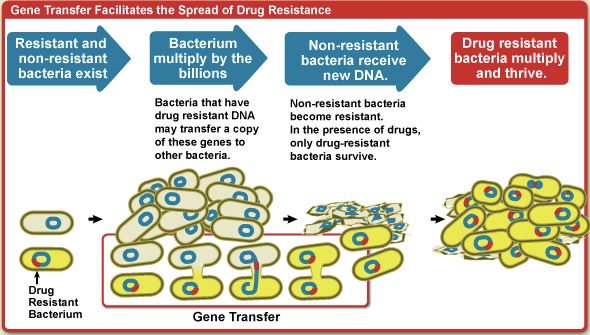 In the presence of an antibiotic, bacteria are either killed or, if they carry resistance genes, bacteria survive. Gradually, the population changes, and genes that improve survival and reproduction will become more common while genes that are disadvantageous to survival and reproducti will become more rare. These changes in the genetic makeup of a population happen through mutation or gene transfer, it leads to the evolution of the strain. In his 1945 Nobel Prize speech, Alexander Fleming, who discovered penicillin, warned that bacteria could become resistant to these remarkable drugs. 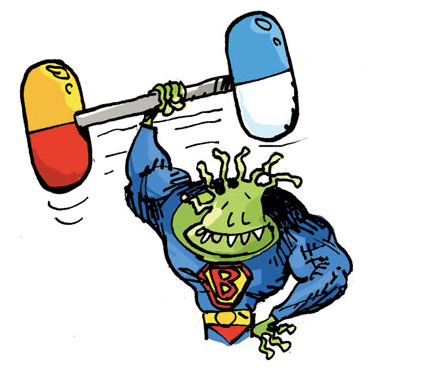 Nevertheless we could wonder what are current evidences showing the burden of antibiotic resistance? What are the health and economic consequences of antibiotic resistance? 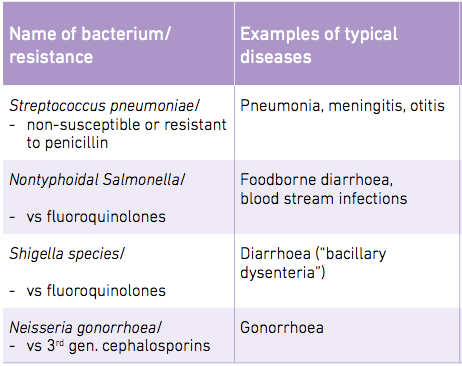 In this section, we will first take note of the main strains responsible for diseases as a major public health concern. Hence we will be able to analyze health and economic outcomes related to antibiotic resistance. 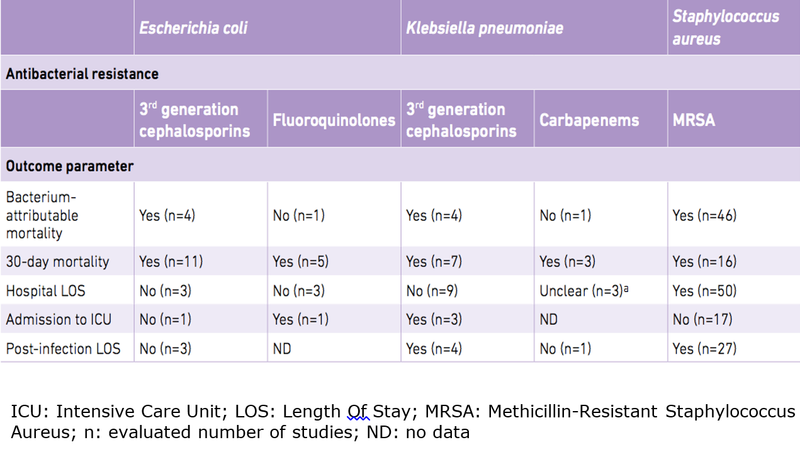 Are clinical outcomes different or worse in patients who are treated for infections caused by bacteria with a specific resistance compared to those who are treated for infections without this resistance? The following table summarizes the findings of published scientific literature. Are economic outcomes and costs different or superior for patients who are treated for infections caused by bacteria with a specific resistance compared to those who are treated for infections without this resistance? “Without urgent, coordinated action by many stakeholders, the world is headed for a post-antibiotic era, in which common infections and minor injuries which have been treatable for decades can once again kill” says Dr Keiji Fukuda, WHO’s Assistant Director-General for Health Security. What actions could be implemented to fight antibiotic resistance? We can borrow tools that are implemented for the energy crisis. It would be helpful in thinking about how we might want to do this in the case of antibiotics as well. One of the solutions is obvious; we have to better use existing antibiotics. It could be implemented in several ways; these following reflections are ranked from the most tenable to the least achievable. Certainly consumer education works. Very often, people overuse antibiotics or prescribe too much without knowing that they do so. It is necessary to teach patients how not to demand antibiotics and in addition we have to taught doctors how not to use antibiotics as much. In hospitals, a simple example is to put up on a chart the names of surgeons in the ordering of how much antibiotics they used in the previous month. It is a purely informational feedback. Practitioners would be more inclined to rethink how they use antibiotics. Let’s use the energy metaphor: In order to try to rely less on fossil fuels, we have implemented clean energy subsidies. It consists in using non-pollutant fuels instead of fossil fuels. The analogy with antibiotics is that we need to move away from using them and find substitutes. It turns out that anything that reduces the need for antibiotic would really work. It includes improving hospital infection control or vaccinating people. An other option might include tradable permits. 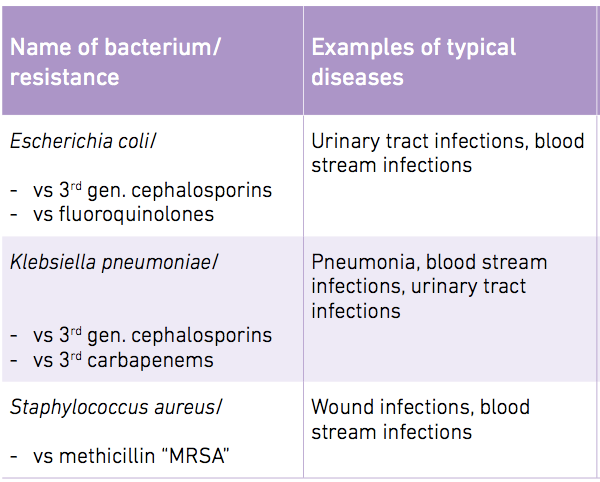 In a near future, we might not have antibiotics for many people who have infections; we could then consider the fact to allocate who gets to use some of these antibiotics over others, on the basis of clinical need, but also on the basis of pricing. If we consider energy pricing, for instance, emissions taxes, which means we’re imposing the costs of pollution on people who use that energy. We might consider doing that for antibiotics as well. It would make sure that antibiotics get used appropriately. One solution could be to invest more into Research & Development in order to find new antibiotics. These two first options (better use existing antibiotics and find new ones) can be seen as mutually exclusive: if we invest heavily on new pharmaceuticals, we reduce the incentives for a rational use of drugs. In return if we use our antibiotics appropriately, we don’t necessarily have to make the investments in new drug development. We face what economists call “tragedy of the commons” with antibiotic resistance (and more broadly with antimicrobial resistance). This problem occurs when multiple individuals, acting solely out of self-interest, ultimately exhaust a limited shared resource despite the fact that it is not in the community’s long-term interests. We have squandered our ability to control; indeed we have not recognized that natural selection and evolution was going to find a way to get back. We need to completely rethink how we’re going to use measures to control biological organisms, and rethink how we use of these valuable resources: antibiotics. WHO. (2014). Antimicrobial resistance : Global report on surveillance. France: WHO Press. Bruce J. Fried, L. M. (2012). World Health Systems: Challenges and Perspectives. Kieran S. O’Brien, S. B.-S. (2014). Antibiotic Use as a Tragedy of the Commons: A Cross-Sectional Survey. Computational and Mathematical Methods in Medicine . National Research Council, Committee on drug use in food animals. (1999). The use of drugs in food animals: benefits and risks. Washington DC: National Academy Press. Mauldin PD, S. C. (2010). Attributable hospital cost and length of stay associated with health care-associated infections caused by antibiotic-resistant gram-negative bacteria. Antimicrobial Agents and Chemotherapy , 109-115. Mellon M, B. C. (2001). Hogging it: Estimates of antimicrobial abuse in livestock. Union of concerned scientists . Came across this article when researching on the antibiotic resistance issue, thank you for your insightful thoughts and information, really came in helpful especially when I am working on a school project regarding the antibiotic resistance crisis. This is coming from a 17 year old biomedical science student here in Singapore and am currently working on a report that lack some designs for the cover page of our report. Can we have the permission to use the above photo as the design for our cover pages in the report?